Even parents opposed to Sats tests will not want them to be scrapped by schools at such short notice, says the co-founder of a parents' website. 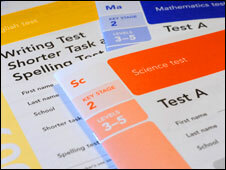 Head teachers have voted for a boycott of next month's tests in England. But Siobhan Freegard of Netmums says it would be wrong to send such a confused message to children - to make them revise and then scrap the tests. Heads' union leader Mick Brookes says he is still open to last-minute negotiations with ministers. Last week, the National Association of Head Teachers and National Union of Teachers voted in support of a boycott - with details of any action set to be announced on Wednesday. The tests are scheduled to be taken by hundreds of thousands of 11-year-olds (Year 6 pupils) from May 10th. The NAHT's general secretary, Mr Brookes, says he is still "happy to talk at any time" to ministers and that the "door is open" to negotiations before a boycott goes ahead. Head teachers are also offering to go to ACAS arbitration, he says. A spokeswoman for the Department for Children, Schools and Families also emphasised that "our door is open" to further discussions. Netmums co-founder, Ms Freegard, said that parents would be concerned at the idea of children preparing for a test which never takes place. "It's like putting them in a race, getting them ready, showing them the finishing post and then calling it off... It's pulling the rug from under them," she says. Ms Freegard says she believes heads and teachers are "responsible professionals" and that many parents will share their concerns about the negative impact of the tests on the last year of primary school. But she says that setting aside their views on Sats, parents will be unhappy at the prospect of pupils being stopped from taking the tests at such a late stage. The prospect of a boycott has divided opinion - both among teachers and parents. Another parents' website, Mumsnet, says that parents using the website have been broadly supportive of the boycott going ahead. Other unions are opposed to the boycott. John Dunford, general secretary of the Association of School and College Leaders, said that while external tests at the end of primary school needed reviewing, "some form of robust, external assessment" was necessary. "Just as secondary schools are held to account through GCSE and A-level results, it is entirely right that there is some form of assessment at age 11 through which primary schools are held to account," said Dr Dunford. The NASUWT is also against the boycott of Sats. Siobhan Freegard says she would be sympathetic to a compromise idea, which is being floated, that pupils could go ahead with the tests, but they would not be sent off for external marking. Instead schools would mark the test papers of other local schools, without these results being available for league tables. Mr Brookes says that if the boycott went ahead, this proposal for schools marking each others' paper would be an option likely to be considered. He also recognised that there would be concerns about cancelling the tests after children had been revising - describing it as the "Mastermind scenario, I've started so I'll finish". But he says the timing of the ballot and any announcement to take action were governed by industrial relations legislation, which requires action to be taken within a month of a ballot. And Mr Brookes repeated his union's opposition to the Sats test system, saying he was not against the principle of testing, but was opposed to how the results were used. The DCSF spokeswoman said ministers were still open to discussions. "As Vernon Coaker said last week we need to keep talking about the future of testing and accountability - and to not let children and parents down. So our door is open - ministers and officials have been talking to NAHT throughout." As a secondary school teacher I have always been opposed of the reasons behind Sats. however, as a parent of an 11 year old, to abolish them at such short notice would be wrong. Since September, she has had Sats preparation 'drummed' into her. After all the hard work to now pull the plug would be so negative on her and her classmates. I think this boycott is an unholy alliance between parents who thing their little darlings should not suffer the slightest stress in their whole lives and teachers who do not wish to be held accountable for the quality of outcomes they are providing for their children. Sats are extremely important. They show us clearly where the educational system is failing and urgent action needs to be taken. Without Sats how would we have known that the local primary school was way below the national average and urgent action needed to be taken (this involved the sacking of the head teacher and new management being installed). Because of this change the ability of the new head to make the changes required the school is now well on the way to recovery, there is a new buzz about the place. Primary school education is the critical foundation upon which our children progress. If they receive a poor primary school education, then they are handicapped almost before they have started. It's fine for the heads to say that some children are "hard to teach" and the parents "hard to reach", but it's no good burying your head in the sand and pretending you don't have a problem that needs urgently addressing. I think it is pathetic that teachers don't wish to be held accountable. If your school is poor then don't just blame the kids, the teachers and school are also at fault. Many failing schools I see are just as much due to the ethos and poor working of the school as the kids and parents. As my 11 year old son has just said - "is it fair to test children just to see how a school is doing teaching its children?" Why do 11 year old children have to go through revision and test pressures just so schools can be 'identified' as good or not...? Why not test the schools/teachers in a way that does not affect teaching/children? As a parent I made a conscious decision to send my child to a high performing school and even moved home to do so. Since I cannot afford to send my child to an independent school at £15,000 per year, I decided to move house instead. If it was not for league tables I would never have known that the school near my old home was infested with the sort of parents and children that don't care about a good education. Children at 11 should be proud to show how good their school is by taking the tests. Pressure is something we should all get used to or do we want to be a society of weaklings who don't like challenges. I took the tests when I was 11, and hated them, but now am glad that I did as I knew what to expect in preparation for, first GCSE and now A-Level exams in terms of nerve levels, it shows how good the school are doing too, and parents will want to know this. Ask Wales, Scotland or Northern Ireland how their children are doing and they will tell you. Do they have league tables? - NO. Is that bad for them? - NO. Do they do SATS the way we do? - NO. Why is England the only UK country still subjected to this system? People wanting to be elected as MPs next month read carefully.. Most people do not want this system in England; children, teachers, parents. Listen to your electorate. I am currently in year 13 and have no horrid memories of when I did SATS in year 6. Children need to learn how to face exam conditions, if they are to have any success in later education. Schools put a lot of pressure on these tests, but it is pressure that has to be learned to be dealt with eventually. I think the SATS system is a good system, and should not be withdrawn, however schools should not be allowed to teach "to the exam" as opposed to teaching for education. I teach at an excellent school but we also place a lot of importance on inclusion. I have 4 children in my class who cannot sit the SATs because of learning difficulties and 3 others who have a problem that will mean they struggle. We are forced to include their results with everyone else. When this is converted in to 'raw' data our village school will appear to be under achieving despite fabulous staff who work all hours. Does this make sense? As parents, my husband and I chose our children's primary school based on league tables - after all, that was really the only information we had to go on. It was a battle to get them in, but we were relieved when we did. It's still one of the top schools in the area with an excellent reputation. However, 4 years on (my son is now in Year 3), we've learnt a lot about how league tables are misleading. The SATs results don't tell you how many parents paid (and for a number of years, I might add) for their children to have tuition. They also don't tell you how much homework the children (or rather the parents) have to do week in, week out. What we have discovered, is that we live in a middle class area, where the PARENTS are behind the SATs results, NOT the school. The results tell you nothing about the ability of the teaching staff, nor the ability of the school to deal with everyday issues such as bullying, special needs etc. The school doesn't care about the individual pupils, just about their results and position on the league table. As a result of our complete misery we have finally decided that enough is enough. We are going to move out of the area, and when we choose the new school for our children, we are going to ignore the league tables and find a place where the pupils are more than just a number. There is far more to life than school, homework and exams! Head teachers at hundreds of schools in England stage a boycott of the national schools tests for 11-year-olds. Watch What are Sats tests?